In the earliest of Her stories, Gaia – also known as “Ge”, meaning Earth – was the possessor of the oracle in Delphi, the place at the foot of Mount Parnassus in Greece, that was said to be the font of sacred knowledge, the navel of the world – the Omphalos of Greek tradition. It was Gaia’s Wisdom that was being listened for, and continued to be, even though the names of its ruling deities changed. Earth – Ge, Gaia – was understood as the “primeval prophetess”. To listen to Her one could sleep “in a holy shrine” with an ear upon the ground (and it is interesting how that expression “keep your ear to the ground” survives, to speak of how one might really know). Her priestesses often sat on a tripod over vapours arising from a crevice: a tripod perhaps because of the holy Three being significant, and also perhaps practical, so the priestess could sit with her legs astride opening her bodymind. It is now thought that the site of this oracle was originally located high up on the shoulder of Mount Parnassus in “a mystery center” called the Corycian Cave, and that it was presided over by Three Sisters – a triad of Goddesses called the Thriae. The Thriae are said to have invented the art of prophecy – their name means “little stones”, which story tells, they threw into an urn of water and watched how they danced. These Three Sisters taught the later gods the art of “divination”, which I translate to “knowing the mind of the divine”, though they themselves often came to be referred to merely as “nymphs” which in patriarchal times enabled a lowering of their status. There has also been much note in various texts, of another Three who were “bee-maidens”, with a very similar name – the Thriai – also said to be the teachers of divination at Delphi. Some researchers address them as the same entity – as “the Triple Muse of Divination at Delphi” . By whatever name, it was They who spoke Gaia’s potents/potentialities to those who wished to listen. We may glean from these fragments of story found scattered in many texts – these shattered pieces of ancient vessel that once held a matrifocal culture – that it was from within the Corycian Cave that Gaia spoke to Her people, Her very offspring … in the earliest of stories of this tradition. Later, sometime in the eighth century B.C.E., the Cave was abandoned for the present location and re-dedicated to Apollo. This Cave may be thought of as Gaia’s Womb, which in our time is no longer simply located on this mountain in Greece: many now globally name our whole Planet as Gaia. And Her Womb, the sacred Navel of the World, may be understood to be located in any number of places – wherever one chooses to sit (or dance or play or lie down) and open to receive Her teachings. Such a site then becomes the primary Temple – the “holy shrine”: that is, the Place that houses the sense/sensation of the real Space and Time in which we most truly live, the Centre/Mother who holds us at all times … of whom we may become conscious. Such consciousness – “sacred awareness” – is often called “trance” … and indeed such awareness is “en-trancing”: one’s mind will be changed. Shift will happen. Gaia’s Cave is within as much as anywhere – in the dark sentient space that each being mostly consists of: there is no need to go anywhere. The Sacred Space may be called forth to consciousness, from the Womb in which we are immersed. 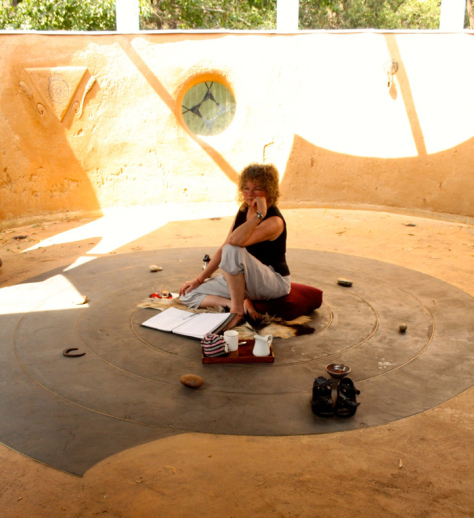 Sacred Space – an Omphalos – may be re-created, for Her to rise up from the depths within and speak. She has done so under the guise of many names and places in different sacred traditions of the globe … Earth Mother, known as Gaia in Western philosophical/religious texts, and now named as an entity in scientific texts, has been recognised as the Ground of lore/law by which to live and act. In Australia this Law has been called “Tjukurpa” by Indigenous people. The ceremonial celebration of Her Creativity expressed in the flow of the Seasonal Moments may be an entrance to Gaia’s “cave”, a womblike Place where one can be held: a method of becoming intimate with Her. The circle of the year that is paced with the consistent year-long practice of seasonal ritual, may be a refuge, a safe place that can be trusted – it becomes a Place, a sacred site. Earth’s journey around Sun is a sacred site, and joining one’s consciousness to that journey – which we all make everyday, whether conscious or not – makes sacred one’s journey. One’s ear will be to the Ground. The sacred space that is created by such practice of Her whole annual wheel of seasonal transitions, is a Womb that holds one … one may come to feel held in Her Dynamic of Creativity, where She speaks. It may be considered a task for those who desire Her and know Her: to bring Her forth in this way. I do suggest a small tangible and portable wheel of stones that represents the Seasonal Moments of Earth’s journey … and hence one’s own journey of practice of these ceremonial celebrations. Such a modest construction re-assembles Her Womb for one’s bodymind, within which one may sit. And the “tripod” upon which one is sitting will be the Triple Muse – the triple-faced Dynamic of never-ending renewal that is celebrated in this complete cycle/circle. Such an assembly is a medicine wheel, for it locates one in the Present. The whole annual wheel of Seasonal Moments/transitions holds within it awareness of the dark depths upon which the present is built – the past: and all that is gestating within these depths – the seeds of the future, and all that is manifest right now: a sacred Three, which I name as She Who creates the Space to Be, She Who is the Urge to Be, and She Who is this Dynamic Place of Being. Minds and imaginations must be fed good food – good story within which to grow, like plants do in good soil. But many minds are fed only junk food – “news” and sermons of consumption, immersed in tick-tock time 24/7. What metaphors might be chosen instead? What Poetry could be the staple diet within which to be sit-uated? The Triple Muse of Divination awaits. She has a long track record of Creativity in which we are all immersed and of Whom we are subjects. One doesn’t have to be a sage – simply a child willing to receive, “like a child ere it has breathed”. It has been my experience that in this Womb of Gaia’s, I have and do become More – more than I thought I was. Within Her circle of creativity I may expand into my whole Self, who is always within me, seething in the quantum foam, waiting to be invited forth. 1 Charlene Spretnak, Lost Goddess of Early Greece , p. 46. 2 Charlene Spretnak, Lost Goddess of Early Greece , p.45. 3 Adam McLean, The Triple Goddess , p.79. 4 Adam McLean, The Triple Goddess , p.79. 5 a Pitjantjatjara term for the law of their Land. 7 Jami 1414: note that this poem is usually translated with male metaphor, but need not be. Try rewriting it with female metaphor – it works much better. and I acknowledge the work and advice of Dr. Marguerite Rigoglioso for clearer understanding of the earliest parts of the story of Gaia’s sacred site, and Her priestesses. McLean, Adam. The Triple Goddess. Grand Rapids MI: Phanes Press, 1989. Rigoglioso, Marguerite. The Cult of Divine Birth in Ancient Greece. New York: Palgrave MacMillan, 2009. Spretnak, Charlene. Lost Goddesses of Early Greece. Boston: Beacon Press, 1992. Published in G.A.I.A. 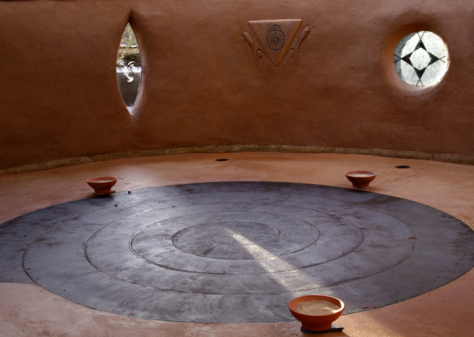 Newsletter October 2008, and re-published at Return to Mago blog as En-trancing Gaia’s Womb Through Seasonal Ceremony: Re-creating Her Sacred Site in 2012.